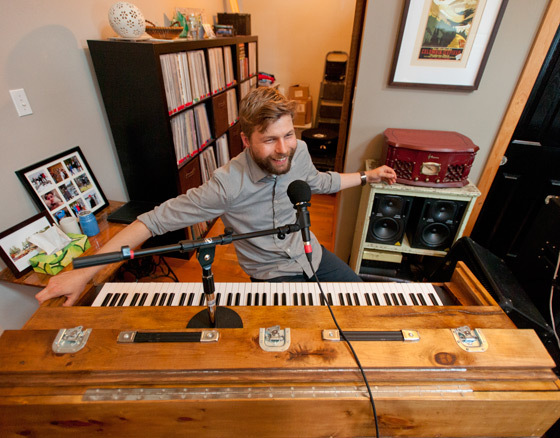 "Our band isn't what it was," Will Currie says, seated behind a Korg SV-1 keyboard in his cozy living room in Waterloo, ON. One of his bandmates in the Country French, bassist Daniel MacPherson, looks on as Currie fields questions about their new concept record, They Killed Us. His responses include sombre stock-taking of the work they've done together over the past eight years. "There was a time where we were touring the country a lot and on this upward trajectory," Currie says, "and then we just sort of stopped for various reasons. We didn't do anything for two years. "And in writing They Killed Us, it ended up being about expectations being tapered, growing up and that not everything will be the way you think it will be when you're young. That's totally fine, but it's coming to terms with the fact that we have day jobs and other things going on." There's a whole streak of practicality in Currie's approach to life and music. He works for a local company that salvages and repurposes wood, and he and his wife are proud of the small, 149-year-old downtown house they bought last July. The living room doubles as a jam space for the CF and they record demos and practices as they go. It's all unassumingly utilitarian yet perfectly precise, much like Currie's approach to pop music. Though he went to Wilfrid Laurier University to study percussion, Currie eventually pursued piano. The fact that the first concert he attended was by wry, ivory-tickling balladeer Rufus Wainwright might well have set Currie down a particular path. He was in grade five when he saw that show, and found Wainwright's epic songs overwhelming. Their mark is readily evident within Currie's music. "At first, I thought I should shy away from it or pretend it wasn't true because it's so close," Currie says of his Rufus resemblances. "I didn't want it to be, 'It seems like you're a bit of a rip-off, maybe.' But when he's your favourite artist when you're ten, you're gonna start writing and singing songs that way. "I don't think it's a carbon copy, but I hear it too. Like a poor man's, terrible version of Rufus Wainwright; that's the way I see it. Sometimes when I listen back and hear the way I sing certain words, I think, 'I did that because Rufus does it like that.'" A lefty, Currie says playing guitar was bound to be a hassle so he never took it up. In fact, he says he isn't musically proficient at anything other than piano, which he approaches in a rather unique manner. "I play the piano like a drummer does; my playing is fairly rhythmic. I like to do my bass in just one octave. It's not so much my fingers are separate as much as it's my hands. "If it's a pop song and I'm going hard, I'm not doing anything too fancy normally. I'm playing with two-hand independence instead of ten-finger independence. Ben Folds was also a percussion major, and I think he does the same thing." The aforementioned Korg appeals to Currie because of its weight and piano sound, which he never strays from. His is housed in a beautiful wooden case that he finished. The lumber isn't meant to seem old-timey or anything; Currie isn't an analog devotee. "A lot of bars have an upright in the corner and you're like, 'Wow, that would be cool to play,' but nine times out of ten it's terribly out of tune and difficult to amplify properly," he says. "I used to be a purist. For our last record, we bought an upright piano and put it in the studio. This time around, I wasn't quite as picky. I play a couple of different pianos and some of them are real and some of them aren't, but you can do a lot with mimicking sound and no one knows or cares." For Currie, control is key. His commanding execution is reflected within the sophisticated pop of They Killed Us and its quirky yet tightly knit dynamics. "I think this is what I've always really wanted to write — this balance of pop and mellowness," he says. "It's from living a slower-paced life, maybe."